GSAT-12 is a 1,410 kilogram satellite which was constructed by the Indian Space Research Organisation (ISRO), and will be operated as part of the Indian National Satellite System, or INSAT. It cost around 2 billion Indian rupees (short scale billion, about US$45 million) to build, and will be positioned at a longitude of 83 degrees east.Based upon the I1K satellite bus, GSAT-12 carries twelve transponders and is expected to operate for seven years. It is the second I1K-based satellite to fly, the first being the Kalpana-1 weather satellite. Kalpana-1 was launched in September 2002 as Metsat-1, before being renamed after astronaut Kalpana Chawla, who was killed in the Columbia accident in 2003. GSAT-12 will replace INSAT-3B, which was the first third-generation INSAT spacecraft to be launched. INSAT-3B was launched by an Ariane 5G rocket on 21 March 2000, and has already exceeded its ten year design life. The INSAT programme began with the launch of four first-generation satellites between 1982 and 1990. These spacecraft were built by Ford Aerospace, and expected to last for seven years. The first, INSAT-1A, was launched in April 1982 aboard a Delta 3910 rocket with a PAM-D upper stage, however it ran out of attitude control propellant after just eighteen months in orbit. The second satellite, INSAT-1B, was deployed from Space Shuttle Challenger on 31 August 1983 as part of the STS-8 mission, following its successful launch the previous day. INSAT-1B was more successful, performing broadcast operations until 17 July 1990, and remaining operational as a backup for a further three years. INSAT-1C, which was originally built as a backup for INSAT-1B, was launched aboard an Ariane 3 on 21 July 1988 to replace INSAT-1A. Sixteen months after launch it failed after losing its Earth lock. The final first-generation satellite, INSAT-1D, was launched on 12 June 1990, using the second and final Delta 4925 rocket. It remained operational until around May 2002. Five second-generation INSAT spacecraft were launched between 1992 and 1999, beginning with INSAT-2A on 9 July 1992, followed by INSAT-2B on 22 July 1993, INSAT-2C on 6 December 1995, INSAT-2D on 4 June 1997, and INSAT-2E on 3 March 1999. All five launches used Ariane 4 rockets. These satellites were based on a custom bus built by ISRO, which would later lead to the development of the I2K bus. INSAT-2D failed in orbit, and the Arabsat-1C spacecraft was purchased to replace it, being renamed INSAT-2DT. INSAT-3B was the first third-generation satellite to be launched. It was followed by INSAT-3C, which was launched on an Ariane 4 on 23 January 2002. On 9 April 2003, INSAT-3A was launched aboard an Ariane 5G, and this was followed by INSAT-3E on 27 September 2003, also on an Ariane 5G. INSAT-3D is a weather satellite, which has not yet been launched. Third generation satellites are based on the same bus as second-generation satellites, or on the I2K bus which was developed from it. The first fourth-generation satellite was INSAT-4A, which launched aboard an Ariane 5GS on 21 December 2005. The next, INSAT-4C, was launched on a Geosynchronous Satellite Launch Vehicle (GSLV) on 10 July 2006, however it failed to achieve orbit after the rocket was destroyed by range safety. The next satellite to be launched was INSAT-4B, which successfully reached orbit atop an Ariane 5ECA on 11 March 2007. On 2 September 2007, the INSAT-4CR satellite, a replacement for INSAT-4C, was launched on a GSLV. The rocket underperformed, leaving the satellite in a lower than expected orbit. INSAT-4CR remains operational despite several reported problems. The most recent INSAT satellite to be launched is INSAT-4G, which was placed into orbit by an Ariane 5 on 20 May this year. That spacecraft is also known as GSAT-8. 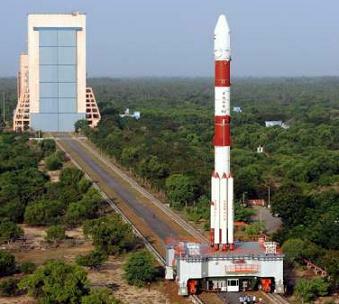 Two more INSAT-4 satellites are scheduled to be launched: INSAT-4E and 4F are both planned to be launched by GSLVs. INSAT-4D, which was built as a spare, was rebuilt as the GSAT-5P satellite, and lost in a launch failure last December. The GramSat (GSAT) series of satellites began in 2001, with the launch of GSAT-1. Launched on the maiden flight of the GSLV, it was placed into a lower than planned orbit, and did not have sufficient fuel on board to reach its intended geostationary orbit. GSAT-2 was successfully launched on 8 May 2003, also using a GSLV. 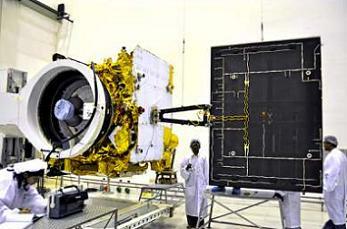 GSAT-3, also known as EduSat, was also launched successfully aboard a GSLV, on 20 September 2004. The fourth GSAT spacecraft, GSAT-4, was launched on the first GSLV Mk.II on 15 April 2010. The rocket featured a new Indian-built cryogenic upper stage; however the launch ended in failure after this stage failed to ignite. A fifth satellite, GSAT-5P, was also lost in a launch failure when the GSLV Mk.I carrying it went out of control and was destroyed by range safety on 25 December last year. GSAT-6 is a communications satellite which will be operated as INSAT-4E. A second spacecraft, GSAT-6A, was also under development, however it is not clear whether it will be completed or launched. GSAT-7 will be operated as INSAT-4F. GSAT-8 is the INSAT-4G spacecraft launched in May, and GSAT-10 is expected to launch on an Ariane 5 next year. The launch of GSAT-12 was the nineteenth flight of the PSLV, with flight number C17. The launch used the PSLV-XL configuration, which features six PS0M-XL boosters with S-12 solid rocket motors in place of the six regular PS0M boosters with S-9 motors used by the standard PSLV. Otherwise it was the same as a standard PSLV, with a PS1 first stage powered by an S-138 solid rocket motor, a PS2 second stage with an L40 Vikas engine, a PS3 second stage with an S-7 solid rocket motor, and a PS4 fourth stage with two L-2-5 engines. This was the second flight of the PSLV-XL configuration, which was previously used in the launch of Chandrayaan-1 in November 2008. It is currently the most powerful PSLV variant in service. Based on the flight plan, when the countdown reached zero, the PS1 first stage ignited, followed 0.46 seconds later by the first four boosters. 25 seconds after launch, the remaining boosters lit. The ground-lit boosters burned out and separated seventy seconds into the flight, at an altitude of around 2.6 kilometres. This was followed by separation of the air-lit motors 92 seconds after launch. At 112.5 seconds after launch, the first stage separate, and two tenths of a second later the second stage ignited, at an altitude of around 58.8 kilometres and a velocity of about 2.4 kilometres per second. The second stage’s Vikas engine burned hypergolic propellants; UH20 and dinitrogen tetroxide. The second stage heat shield separated 201.6 seconds after liftoff. About 263.3 seconds after launch, the second stage completed its burn and was jettisoned. Around 1.2 seconds after second stage separation, the third stage ignited. At this point the rocket was at an altitude of 132.6 kilometres, and a velocity of 5.38 kilometres per second. The third stage burned for 255.9 seconds, after which the rocket entered a coast phase. The third stage separated 520.4 seconds after launch, and the fourth stage ignited 665 seconds into the mission for an eight minute, 33.2 second burn. The fourth stage burned monomethylhydrazine propellant, with MON3 as oxidiser. Spacecraft separation occurred 20 minutes and 25 seconds after launch. PSLV-C17 was launched from the Second Launch Pad of the Satish Dhawan Space Centre. Originally known as Sriharikota, the launch site was renamed following the death of former ISRO chairman Satish Dhawan in 2002. The launch site has been used for all Indian orbital launches, with the Second Launch Pad (SLP) being built in the early 21st Century. Rockets are assembled vertically, and rolled to the launch pad atop a mobile platform. This is the second PSLV launch of 2011, following the successful launch of ResourceSat-2 in April. Two more launches are planned before the end of the year: Megha-Tropiques in September and RISAT-1 in December. Both of these launches are also expected to carry secondary payloads.